Bulbs, Tubers, Rhizomes and Corms are collectively referred to as “bulbs” but there are major differences between them. They all serve the same purpose, and that is to store food as an energy reserve for the plant to use to complete its life cycle. Bulbs also fall into either hardy and tender categories. Hardy bulbs such as tulips and daffodils can be planted in the fall for spring blooming and tender bulbs like dahlias, begonias and Gladiolas must be planted in the spring for summer blossoms and then dug up in the fall and stored in a cool dry place where they will not freeze. Actually, horticulturalists call these “true bulbs” to differentiate them from the all the other types. 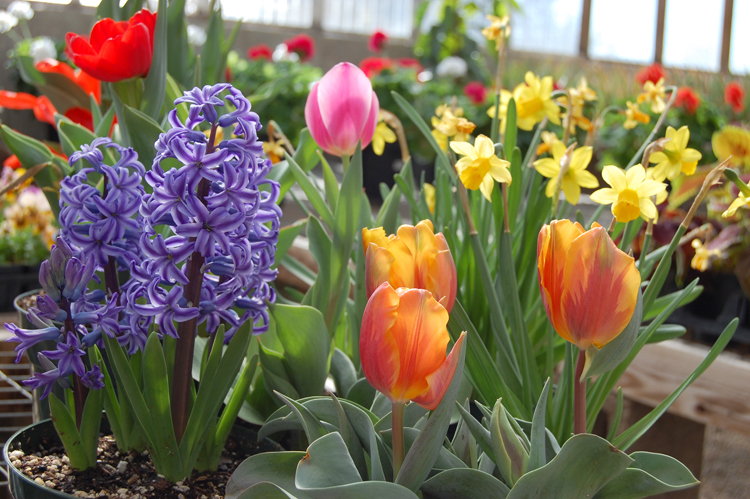 True bulbs consist of layers of modified leaves and contain a miniature flower or sprout in the center. If you cut an onion in half from top to bottom you can see that the roots at the bottom of the bulb anchor the plant to the ground and absorb water and nutrients. Other examples of true bulbs include garlic, amaryllis, tulips, daffodils and lilies. Corms look like true bulbs but do not have layers of modified leaves — they are solid. As the leaves and flowers grow they absorb the nutrients and the corm shrivels up and disappears. One or more additional corms are produced through the growing season which is how the plant regenerates itself. Examples of corms include crocus, Gladiolas and tuberous begonias.